The 2 ply " Maddog"
The Sling Shot was invented by world class powerlifter Mark Bell (545 lb. raw Bench, 854 lb. equipped Bench) to help lifters bench more weight safely and without pain. 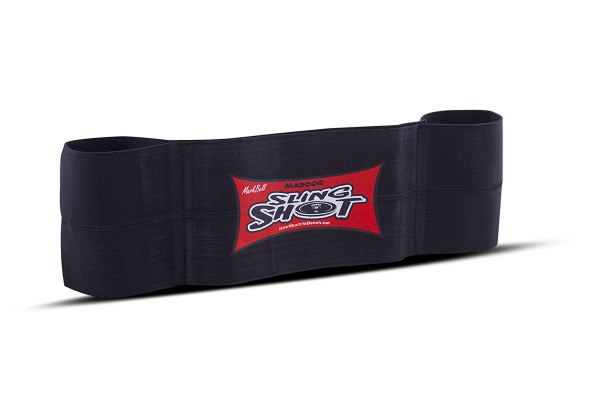 The Sling Shot is easy to put on, easy to use and will help maintain correct form. It is suitable for lifters of all ages and strength levels. The Maddog Sling Shot is the most aggressive model (double-ply) and should be used by lifters that have some experience in equipped lifting or are able to bench over 350 lbs. unassisted. The Maddog Sling Shot is DOUBLE PLY and twice as thick as the original Sling Shot. Named after my late brother "Maddog" Mike Bell, this Sling Shot has more bite. You want extreme support on the bench? Well now you got it. If you can't bench at least your body weight, then you will have to buy the Original Sling Shot until you graduate to "Maddog" status. The Maddog Sling Shot is for the EXPERIENCED LIFTER, if you have to ask yourself ?Am I experienced?? then the answer is probably no! I'm a big fan of the SlingShot (SS) for easily helping my raw lifters to experience overload as part of their training programs. We use the blue, red, and black SlingShots for different purposes. This black (double-ply) version is much stiffer and has more of a break-in period than the others, but once you get used to it, expect a solid 25% (or more) overload with it. The red SS is probably more versatile for most lifters, but for big benchers and/or folks who need a bit of ego-benching, the black SS is just the ticket, and is worth having in your bag. I can touch as little as ~250 to my chest with it, but it really comes to life at 3 plates and higher. They're an excellent value and extremely easy to use compared to other overload methods. I get mine from LiftingLarge because they have the best customer service and fastest shipping of the various resellers. The is a great tool to work into your monthly rotation of ME Bench Days. Highly recommended! Works like it says. Easy on & easy off. Added 35lbs to my max bench with 3 to 5 reps!! Fast shipping, great product. I love this product I have both the Original and the Mad Dog and they both work great. The Mad Dog is for heavy overload days. I Broke my neck 2 years ago and still have issues when I reach 300lbs on the bench with nagging pain. With this product there is no neck or shoulder pain so I can put the heavier weights on without any worries. I was at a Plateau for 3 months at 315lbs and now I have just recently hit 425lb with no problem at all just a few months after purchasing. I would highly recommend this product to anyone who has ever had a neck or shoulder injury. If you can't do a raw 300lb bench I would recommend the Original to start it is a great product to begin with. I have just finished my 2nd workout with the sling shot and may I say....WOW!! This is the real deal, to be able to overload and lift 430x2 after being stuck at 365x1 for ever is so amazing.